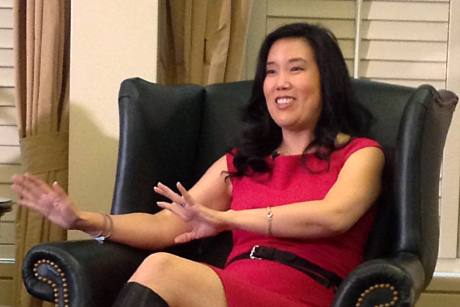 Michelle Rhee ’92 discusses American education in New York City Feb. 5. Self-defined “radical” education reformer Michelle Rhee ’92 met rousing applause Feb. 5 at the Cornell Club in New York City. “If bringing some common sense to a dysfunctional system makes me a radical, then I’m okay with that,” she said. According to Rhee, the United States spends the most per capita per student, but American children continue to rank 25th out of 30 developed nations in math, 17th in science and 14th in reading. Academic achievement levels of American schoolchildren today are on par with those from the 1960s and 1970s, but other countries are leapfrogging ahead of us, she said. Education reforms affect the country on a global scale, she said, as lack of high-quality education fosters the decline of future global leaders. Rhee’s goal is to restructure America’s education system to put students first. Effective teachers are the key to unlocking student success, according to Rhee. As chancellor, she championed an evaluation system that rates teachers on the basis of classroom observations and student performance. Rhee acknowledged that many children face sobering obstacles. “[Perhaps] nobody put them to bed the night before at a decent hour, nobody fed them breakfast before they came to school, maybe the electricity got turned off in their house so they couldn’t do their homework,” Rhee said. But these can’t be excuses, insisted Rhee. Despite obstacles, children can achieve at the highest levels in the classrooms of truly effective teachers. Socioeconomic disparity is more of a reason to push children. “The U.S. ranks toward the bottom internationally on social mobility,” Rhee said. A poor child growing up in America has a 50 percent chance of attending a failing school, in turn, limiting their future potential. “That’s criminal in my mind, so we can’t allow poverty … to be the determining factor of a kid’s chances in life,” she added. If people abandoned the lens of partisan politics and started making public policy based on the decisions we would make for our own children, we would have a student-first agenda that would put the United States on a different trajectory, she concluded.